Vithika is one of the founding Partners and leads the Trademarks Practice at Stratjuris Partners. After completing her B.Tech in Biotechnology she pursued a career in law. She obtained her Master’s Degree in Law (LL.M) in Intellectual Property law from MIPLC (Munich Intellectual Property Law Center) and Bachelor’s Degree in Law (LL.B) from Mumbai University. Vithika has sound experience in advising clients in making and expanding their domestic and global trademark portfolios. She has an extensive experience in maintenance of international trademark portfolios, negotiation and drafting of technology transfer agreements. 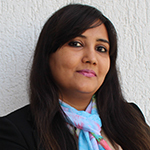 Vithika has accumulated total eight years of experience in both corporate in house and law firm environments. Vithika specializes in Trademark filing and registration, portfolio maintenance services in international territories. Trademark licensing and negotiation of agreements, IPR enforcement matters, market surveillance for grey goods and anti-counterfeiting actions.